There were major news announced during the meeting, like a new Phase 2 clinical trial in CDKL5 deficiency disorder with fenfluramine, a drug that has completed two Phase 3 clinical trials in Dravet syndrome with very strong efficacy, and the announcement that Ultragenyx will develop a gene therapy for CDKL5 deficiency disorder. One of the CDKL5 researchers explained from the stage that 4 years ago there were only 20 publications on CDKL5. Four years later, he was standing in a room with nearly 200 scientists and drug developers, discussing 4 clinical trials. From what we know today about the pipeline, in 4 more years we might already have the first symptomatic drugs approved, and will be running clinical trials with the enzyme replacement therapy and gene therapy that are already in development. This speed of development in a rare disease is truly remarkable. The Chief medical Officer of Marinus echoed these comments by reminding the audience that just a year ago they stood in front of the regulators discussing if “CDKL5 deficiency disorder” was truly a disease or simply a gene that can present as many different syndromes when mutated. After the Loulou Foundation and the patient organizations mobilized and made sure that CDKL5 deficiency disorder was listed in the major disease classification websites and documented as the separate entity that it is, the FDA not only accepted the indication but also approved the first pivotal trial for this disease. We went from not having a recognized disorder to getting green light for a pivotal trial in a matter of weeks. 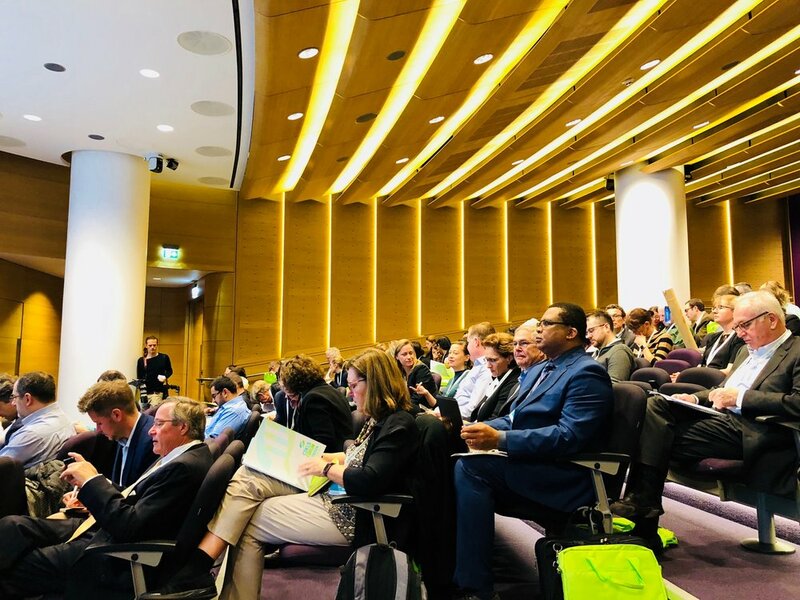 In addition to Marinus Therapeutics, which is in the middle of recruiting for their Pivotal stage Phase 3 trial for CDKL5 deficiency disorder, there were 22 more companies in the room at the 2018 CDKL5 Forum. Last year meeting took place in Boston, and 35 companies attended, but I personally through that the majority would only be there because they have local offices and it was easy for anyone who was just mildly curious to drop by. Having 23 companies come to London means the interest goes beyond mere opportunistic curiosity, and that list of programs in development to treat CDKL5 deficiency disorder is likely to grow in the next few years as this interest materializes in development programs. Phase 3: Ganaxolone, from Marinus Therapeutics, currently enrolling through 40 clinical sites across EU and US. This is the only placebo-controlled pivotal trial requested for registration of the drug, so once completed Marinus should be able to file for marketing authorization. The company estimates to enroll 70 to 100 patients in total. Phase 2: Ataluren, from PTC Therapeutics, currently completing a placebo-controlled investigator-initiated study at NYU Langone Medical Center in children with CDKL5 deficiency disorder caused by non-sense mutations. This study enrolled 9 patients. Phase 2: OV935 (TAK-935), from Ovid Therapeutics in partnership with Takeda, currently enrolling for an open-label study through multiple sites in the US a total of 15 patients with CDKL5 deficiency disorder. Phase 2: Fenfluramine, from Zogenix, soon to start enrolling for an open-label investigator-initiated study at NYU Langone Medical Center in children with CDKL5 deficiency disorder. This study will enroll 10 patients, and was announced for the first time at the CDKL5 Forum. Amicus recently announced a collaboration around a new AAV (gene therapy)-based technology to complement their enzyme-replacement therapy in development for CDKL5 deficiency disorder. With this new approach, they will use a virus to deliver a secretable form of the CDKL5 enzyme to brain of patients, so it can replace the missing endogenous enzyme. The first day of the 2018 CDKL5 Forum meeting brought the groundbreaking news that Ultragenyx, one of the strongest players in the rare disease space, had reached an agreement with RegenXBio, one of the strongest players in gene therapy development, to develop a gene therapy approach for CDKL5 deficiency disorder. With the strong interest that this rare disease is attracting, and its potential tractability by enzyme replacement and gene therapy approaches, we are likely to see the number of companies working in this space grow, and hopefully some clinical trials starting in a couple of years. We have progressed much in our understanding of the biology of CDKL5 and the consequences of the deficiency for cells and animals. One of the main breakthroughs of the past year has been the identification of some of the substrates of CDKL5, which were discovered in separate labs using different approaches and are therefore very solid findings. Interestingly, these key phosphorylation targets are cytoskeleton-binding proteins, which appears to be one of the main cellular domains where the kinase is important. It was also encouraging to see that there are multiple mouse models generated for CDKL5 deficiency disorder, either missing the gene or carrying patient mutations, and that there are some solid phenotypes that are reproducible across labs and that can help carry out preclinical trials in the disorder. Interestingly, these mice don’t develop spontaneous seizures, but with four drugs in clinical trials for the disease using seizures as the primary efficacy endpoint this does not seem to be a problem for the pharmaceutical industry. The consensus in the room was that “a mouse is a mouse” and as long as the mice have clear neurological phenotypes that are driven by the deficiency in CDKL5 they are good models. The most anticipated experiment, the “rescue” experiment where expression of CDKL5 is turned back on in previously deficient mice, is about to start thanks to the creation of a conditional mouse model and the entire field awaits with expectation those results. We also discussed during the Forum that although the first clinical trials in CDKL5 deficiency disorder are using seizure frequency as the primary efficacy endpoint, it is expected that future clinicals will measure more broadly the developmental disability of the disease and any potential improvement from treatment. Speakers from Ultragenyx and Roche explained how the industry approaches the development of new clinical outcomes and the importance of precompetitive collaborations in this space to move the field forward. The Loulou Foundation and IFCR (the US CDKL5 deficiency patient organization) are planning to host an externally-led PFDD meeting with the FDA in 2019 that will also assist with the identification of new meaningful clinical outcomes. A captivating and inspirational Dr Emil Kakkis, from Ultragenyx and the EveryLifeFoundation, shared with the audience his journey to convince the industry that developing therapeutics for rare diseases was worth it, and some of his victories and approaches to turn these aspirations into a reality. He made a call for the use of multi-domain outcomes and biomarkers in clinical trials in rare populations, and why he thinks that the golden age of rare disease treatments is now coming to CDKL5 deficiency disorder. The very young CDKL5 Alliance, the umbrella organization that groups 15 patient organizations and foundations, announced during the CDKL5 Forum the launch of their website with the hope of making it easier for any family around the globe to stay updated about progresses in the field and to connect with other patient families (http://www.cdkl5alliance.org). 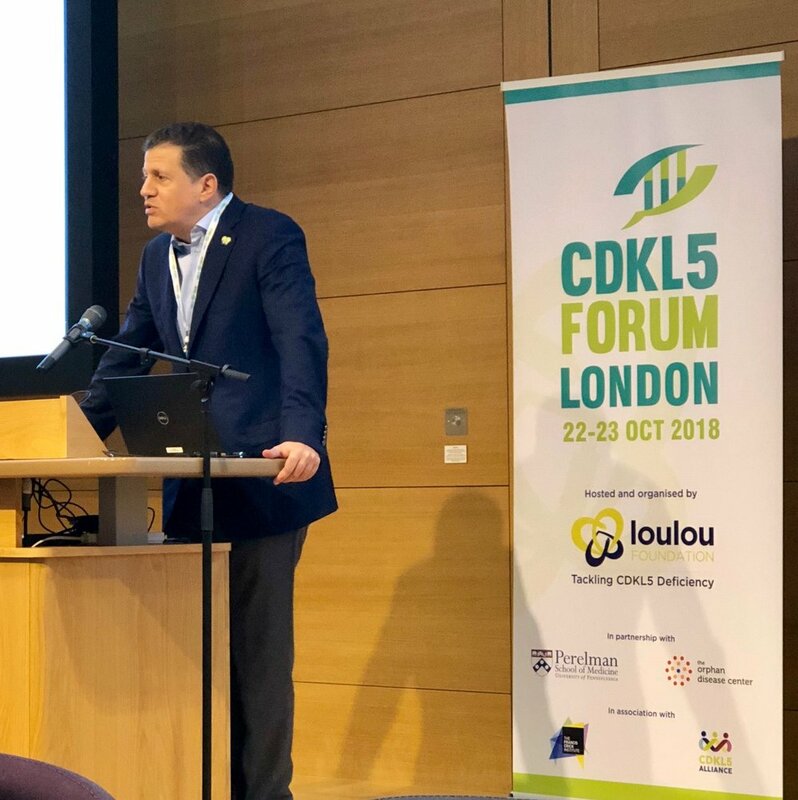 The CDKL5 Alliance met during the Forum and set some of their next priorities, including the identification of more patients and setting Centers of Excellence in every country so that the community is ready to run multiple clinical trials. They also receive the Champion of Progress 2018 award from the Loulou Foundation for building and keeping the community together. During the Forum, the patient groups and the Loulou Foundation were credited with having been instrumental to the large progress in the field so far. From providing the key initial funding to research labs, to helping create Centers of Excellence and reaching out to companies to encourage them to consider their disorder and help them. Essentially, the secret for points 1 through 5 in this summary is the strong patient community behind CDKL5 deficiency disorder. The patient groups and the Loulou Foundation have also managed to createa broader community where scientists and drug developers also find their home. This was particularly visible during the 2018 CDKL5 Forum where drug developers mixed with academic scientists and clinicals as speakers and moderators in the meeting, and where breakout sessions to help design the future of CDKL5 research sat around the table researchers, drug developers and patient parents without distinctions. All in all this was a really good scientific meeting, with strong collaboration from all sectors in the CDKL5 community, and where it became clear that as Dr Kakkis said CDKL5 deficiency disorder is now front and center, and where we have a real opportunity to change the future of the disease.